AIFS students are able to choose from most of the mainstream curriculum at Stellenbosch University. All courses will be offered in English. Most courses meet for 45 contact hours and are recommended for 3 credits. No AIFS participant is permitted to take a course without receiving a letter grade. Pass/fail options are not available. Full Curriculum means that AIFS students can choose any course offered by Stellenbosch University if prerequisites are met. 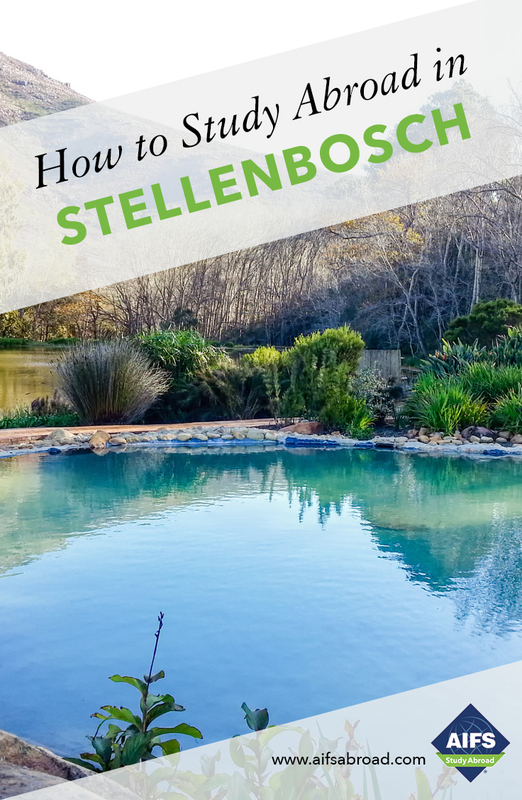 Stellenbosch University has also designed courses with a focus on South African history and culture to give international students a grounding in and introduction to this fascinating country. Subject areas include Agriscience, Art, Biodiversity, Conservation Ecology, English Literature, Global Health, History, International Relations, Languages, Political Science, Science, Sociology and Theology. You will experience South Africa’s educational system first-hand, studying alongside South African and other international students. Choose up to 5 courses for a total of 15 credits. AIFS students may also choose up to 2 courses from the General Education Program of courses at Stellenbosch University (formerly the International Programs at Stellenbosch University), specially designed for study abroad students. In addition to the regular GEP courses available each semester, a series of 2-credit English Electives are available as well. Choose up to 5 courses for a total of 15 credits. Global Service Learning (GSL) is an experiential learning program offered by the Global Engagement Centre of Stellenbosch University and presented in collaboration with Ikaya Primary School. It is comprised of 90 in-class hours (on Mondays) and 45 hours of on-site community engagement (on Fridays). This is a reading and writing intensive program that will require many hours of self-study and group work to enable successful completion outside of "formal" program hours. In addition, students are highly encouraged to make use of the Program Coordinator's office hours for individual discussion and reflection time. The program is situated at the intersection between (international) education, community engagement, and sustainable development. Using a trans-disciplinary approach grounded in complexity theory, it primarily aims to a) harness students' critical self-reflective capacity to engage with contemporary global issues in a local context, and b) use the community engagement vehicle critically as a tool for social impact. We will challenge modernist, reductionist notions of development, investigating alternative possibilities in human-centred development, epistemic decolonisation, social justice, deep ecology, and aesthetic experience. Students interested in the Global Service Learning program must indicate this with their application. Admission is by selection only. Global Service Learning students may choose up to 2 additional GEP courses to fulfil their course requirements, or courses from the mainstream course catalogue, as their timetable permits. Since its founding in 1918 Stellenbosch University (SU) has evolved from a traditional white Afrikaans university to a multilingual melting-pot of cultures. Today, close to 28,000 students representing more than 110 nationalities attend the University. In 2018 SU celebrated its centenary anniversary: 25 years of international engagement and 20 years since the AIFS program in Stellenbosch began. The University is among South Africa’s leading institutions based on research output, student success and rated scientists, and is recognized internationally as an academic institution of excellence. This, together with the scenic beauty of the area, state-of-the-art, environmentally friendly facilities and technology, as well as visionary thinking about the creation of a sustainable 21st century institution, makes for the unique character of Stellenbosch University.